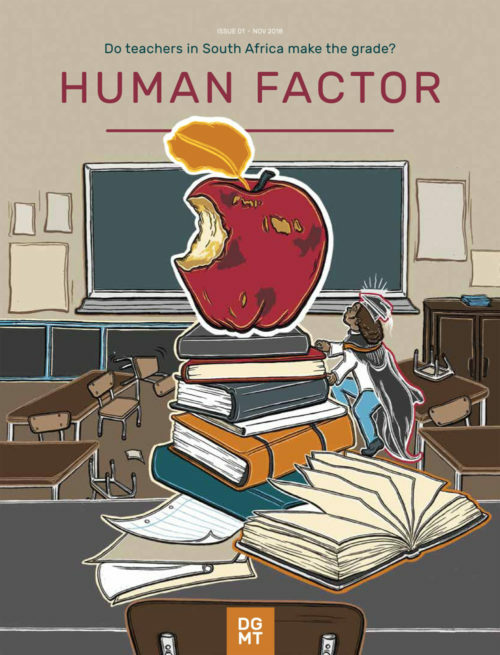 We are pleased to introduce our new biannual publication called the Human Factor. We believe there are only two ways to improve the world – through technology and through behaviour change. The Human Factor focuses on the latter. What drives people and what dispirits them? What ignites new passion, new ideas, new commitment in people, and what stands in their way? Through the lens of the Human Factor, we see people not as the problem in development, but rather as the greatest asset. The first issue is dedicated to the people who hold the potential of South Africa’s children in their hands, several hours a day, five days a week: we look at South Africa’s education system from the perspective of teachers. The education system is typically portrayed through highly technical terms, and in fragmented ways, so our aim has been to stitch together the daily realities of those working and learning in it, each with their own story to tell. Our hope is to cultivate a space where we can look at our teachers and the education system with less judgment and more compassion, less blame and more broad-mindedness; to draw out insight and inspiration from a wide range of people – including some who never thought they had a contribution to make. You can read and download a digital copy of the Human Factor below. We are also distributing a limited number printed copies, if you would like us to send you a copy, please send a request to communications@dgmt.co.za. [Click on the fullscreen [ ] button for a better reading experience].